Enjoy this 1200 sqft 2 BD/2BA half duplex located on East facing side of 9th Street! All new furniture including beds, bedding, and linens. Clean your catch at the fish cleaning table with running water and a sink! Extra large bait freezer is in the carport. Fenced in yard is great for pets or small children. Walking distance to 3 restaurants, park, golf course, tennis courts and the Cabana Club included. Master Bedroom New bedroom suite including mattress and all bedding! King size bed Bedroom 2 New furniture including mattresses. Very roomy and clean in tasteful Keys style. 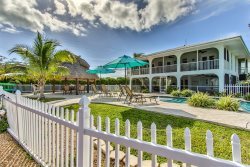 Everything our family needed to enjoy endless days of boating, fishing, and just chillin' in the most wonderful neighborhood of Key Colony Beach. Summer Saturday to Saturday Booking only.